Several years ago, so long ago, in fact, that the internet was in its infancy—if the browser names Mosaic and Netscape Navigator ring any bells, you're in the right era—where carrying a powerful computer around in your hip pocket, one that could answer virtually any question within seconds, was a concept left to science fiction fantasists, and people at dinner parties had to scour actual books to settle arguments about the name of the guy who was in that movie or else argue for hours over the name of the dog that was sent into orbit by the Russians (Laika, for those who care). 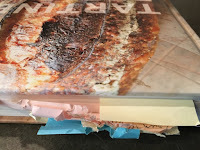 A well-loved (and well-marked) book. Our house was pretty handy for situations requiring reference material, so much so that one visitor dubbed it "the house of books" for the piles that were—and still are—a major part of our living room decor. So when the holidays roll around it's no surprise that books will fill many slots on our gift lists, both for receiving and giving. 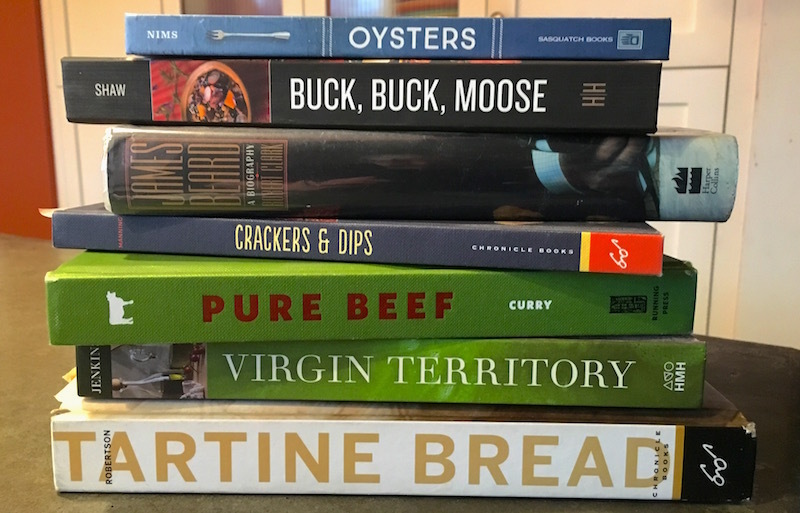 In no particular order, here are a few of my favorite food-centric tomes ideal for the bookish on your list. And feel free to add your own pick by clicking on the comments link below! 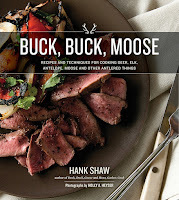 Buck Buck Moose by Hank Shaw. 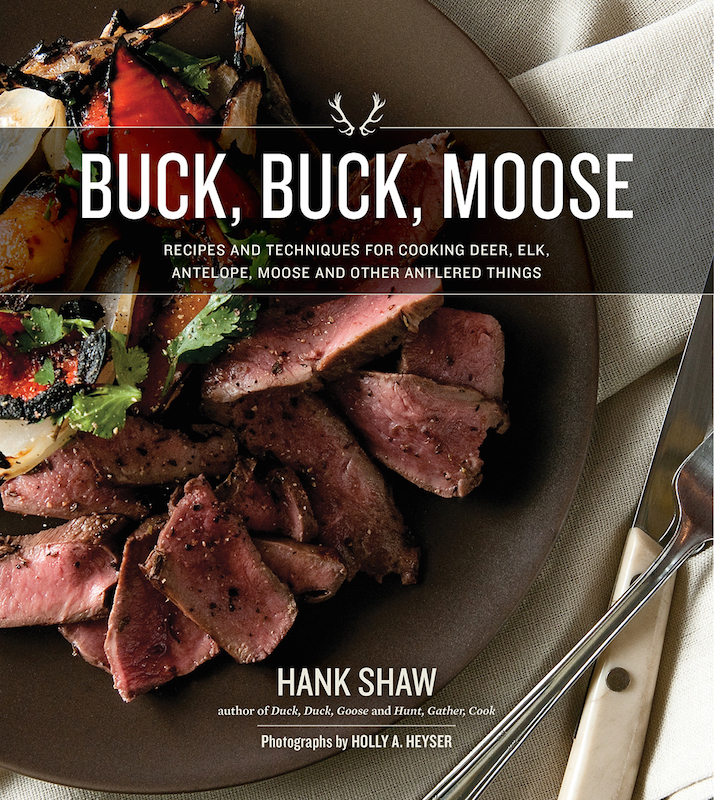 The third book by this self-described "hunter, angler, gardener, cook"—who is a superb writer on those topics as well as a good friend of mine—is a thorough compendium of hunting, cooking and eating "antlered things." Perfect for hunters, it's also a thoughtful treatise on how these animals are deeply intertwined with our history as a species. Carnivorous cooks will appreciate it, too, since his meticulously tested recipes are great even if you can't easily obtain venison—simply substitute beef, lamb or pork. Life Without a Recipe by Diana Abu Jaber. Memoirs are slippery beasts, the good ones treading the fine lines between tell-all and tight-lipped, between my-life-is-so-fabulous and Blanche Dubois, cringe-inducing drama. Abu Jaber, a professor of writing and literature who splits her time between Portland and Florida, writes with skill about growing up the daughter of an American mother, a Jordanian father and a powerhouse of a German grandmother. In this, her second, memoir, she continues the journey she began in The Language Of Baklava, weaving "a book of love, death and cake." Better from Scratch and Crackers & Dips by Ivy Manning. Prolific writer and author of cookbooks on subjects ranging from how to cook for a mixed-diet family to fixing easy weeknight vegetarian meals to one of the best farmers' market cookbooks around, these two slim volumes are packed with recipes so good they're already as well-thumbed as my grandmother's Joy of Cooking. Better from Scratch will stun you with how easy it is to make things you usually buy from the store—often for a premium price—like granola, beef jerky, graham crackers and kimchi. Ditto for Crackers and Dips, where you'll have fun, spend less and enjoy crunchy, sweet and savory treats made from whole grains, real butter, cheese, fresh spices and no preservatives. Oysters and Crab by Cynthia Nims. Seattle writer and cookbook author Nims is passionate about the bounty of the Pacific Northwest, especially the creatures pulled from the depths of the waters off our own West Coast. In Oysters she describes in detail the biology of these amazing shellfish and how they help purify the waters they live in. She then moves on to suggest the best methods of buying, cooking (or not!) and eating them, with more than 30 recipes. Our West Coast Dungeness is the star of Crab, but she also covers its Atlantic and Gulf Coast cousins, delving into the history and importance of the commercial fishing industry, then quickly moving on to how to buy, clean and—with more than 50 recipes—how to cook these beauties. My Beer Year by Lucy Burningham. This book by Portland beer writer Burningham has a long but delightful descriptor: "Adventures with hop farmers, craft brewers, chefs, beer sommeliers, and fanatical drinkers as a Beer Master in training." With wit (as well as Wit), it describes how this young writer and mom fell in love with beer to the point where she decided to become a Certified Ciccerone, going through the rigorous and arcane training and testing regimen to become a beer expert. (And you just thought knowing an IPA from a Porter made you that, right?) Full of character and plenty of characters, its a great book for the beer fanatic in your life. Pure Beef by Lynne Curry. The current dietary advice, as Michael Pollan famously said, is to "eat food, not too much, mostly plants." But if we are going to eat protein, its important to eat animals raised humanely, with their feet on the earth and the sun on their backs. In other words, pasture-raised animals rather than those raised in crowded, confined conditions requiring daily doses of antibiotics to survive. To that end, I heartily recommend Joseph, Oregon, writer Lynne Curry's book on buying, cooking and eating grass-fed beef, an incredibly well-researched and thoroughly recipe-tested primer on how to get the most delicious results possible from these tasty beasts. Virgin Territory by Nancy Harmon Jenkins. Dividing her time between a home on the coast of Maine and an olive farm in Tuscany, Jenkins shares her contagious passion for the flavors of the Mediterranean, a diet she is convinced is one of the most healthful and flavorful on the planet. I've tried several recipes from this book, and I can't argue with that premise. Tartine Bread by Chad Robertson. If you have a bread baker in your life, or someone who's interested in learning to make bread, I can't recommend this book highly enough. My husband worked for two years to make what he considered the perfect artisan loaf, and was frustrated with what he felt were mediocre results until friends got him this book. It was a game-changer, and it apparently has some pretty good recipes for other good things to eat, though those pages remain remarkably unthumbed around here. 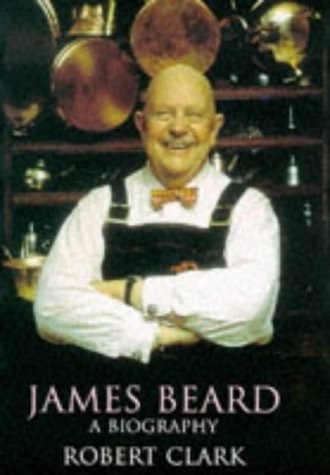 James Beard: A Biography by Robert Clark. As a fifth-generation Oregonian, I thought I knew plenty about native son James Beard. That is, until I read this biography of this world-famous cook, eater and bon vivant. 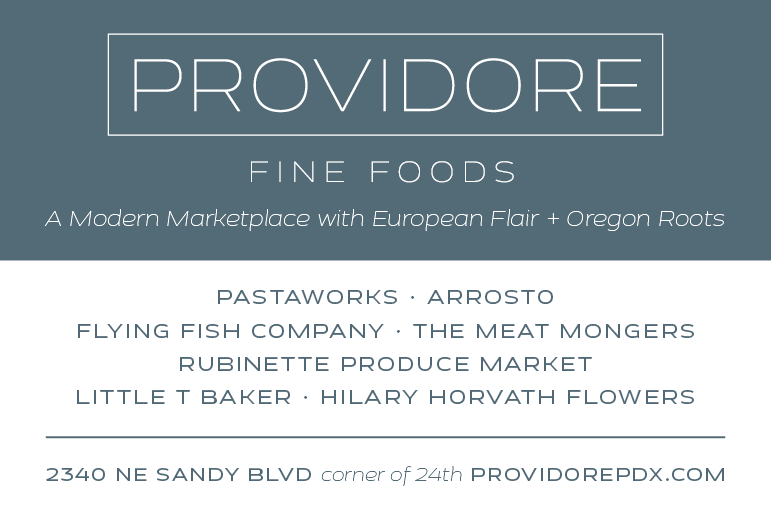 A truly fascinating character in his own right, it follows Beard's upbringing in Portland in the late 1800s, his escape from his controlling-yet-supportive mother to New York and Europe and his lifelong love affair with the flavors and ingredients of the Northwest. In addition, it follows the evolution of the American palate with discussions that add depth and nuance to Beard's at times tragic yet joyful journey.